You are invited to join Forgiveness Coach Jacqueline Hazel, President of Supreme Esteem, Inc. for an amazing venture of the Hawaiian Islands! Welcome to Supreme Esteem, Inc.
Supreme Esteem, Inc. is an inspirational, motivational, take action now company devoted to the empowerment of personal and professional development. This mission is achieved through keynote addresses, retreats and seminars. 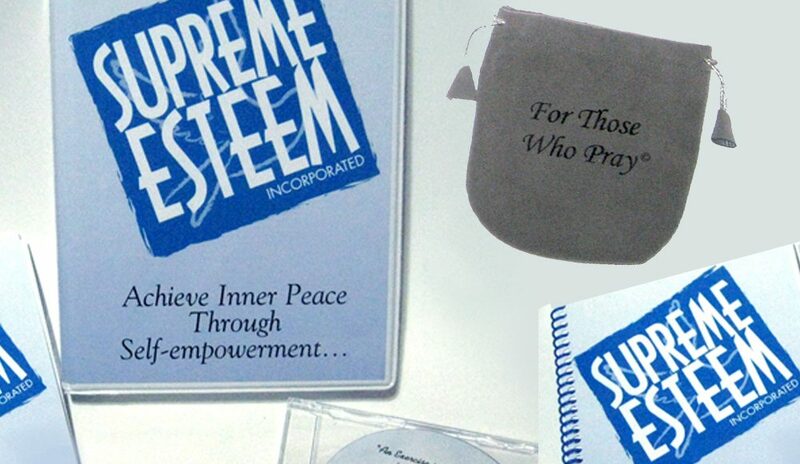 Supreme Esteem, Inc. aspires to be a medium through which individuals, groups and corporations can successfully reach their highest potential in moral principles, personal integrity and professional ethics. You are invited to join Forgiveness Coach Jacqueline Hazel, President of Supreme Esteem, Inc. for an amazing venture of the Hawaiian Islands! 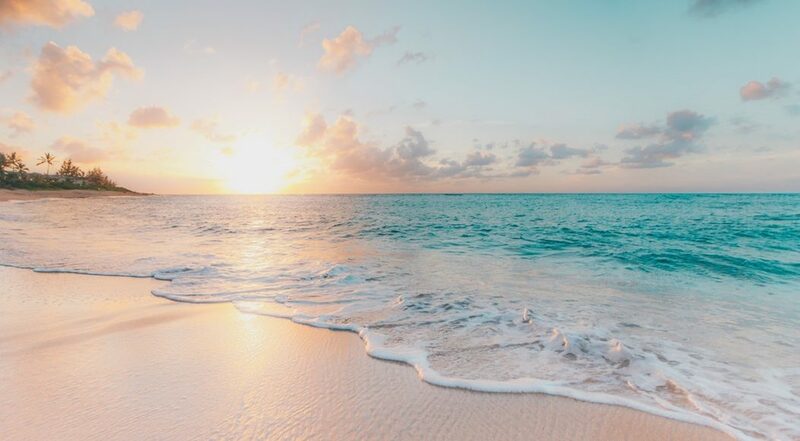 We will leave Fort Lauderdale, FL on Wednesday, July 31, 2019 and return to Fort Lauderdale, FL, on August 11, 2019 (Cruise dates are August 3 – August 10, 2019). 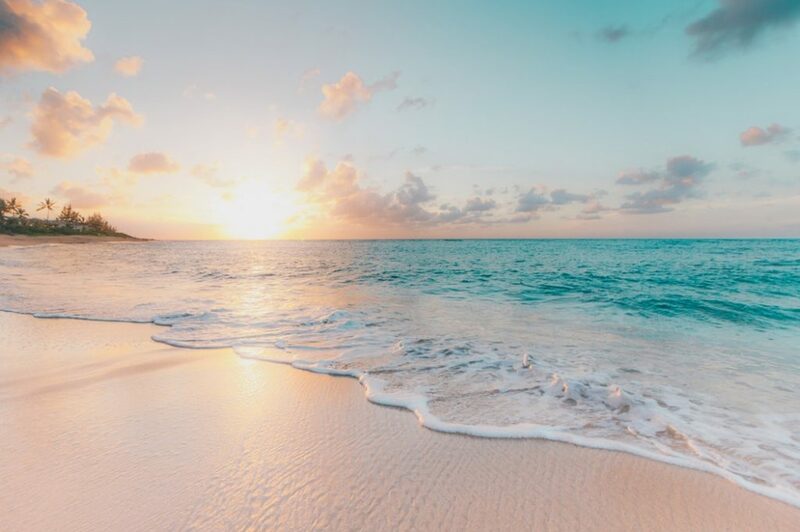 During our stay at the fabulous 4 Star Hilton Hawaiian Village Resort and while at sea, aboard the recently refurbished Norwegian Cruises “Pride of America,” expect to be spiritually renewed, revitalized and refreshed, as we learn what, when and how to forgive. The incredible cost is $5,450! A non-refundable deposit of $700 is due by December 31, 2018. Price includes roundtrip airfare from Fort Lauderdale, Balcony Stateroom/double room occupancy, 3 hotel nights in Honolulu, daily resort charge, Hawaiian Village Cultural Activities, select island sightseeing, ground transportation (to/from hotel-ship-airport), retreat sessions, materials, souvenirs, and one optional individual counseling session. You are responsible for airline baggage fees, all gratuities, travel insurance and other essentials not noted on this flier. NOTE: Price is subject to increase, until full payment is made. No refunds after February 28, 2019. You are encouraged to purchase travel insurance. Payment Plan: January 31, 2019-$1,600; February 28, 2018-$1,600; and final payment March 21, 2019 – $1,550. Full payment is acceptable in lieu of the payment plan. Click here to make payments today. What better day to practice the power of forgiveness than on Valentine’s Day. After all, forgiveness is a by-product of love. Join our diverse community as we come together to release pains of the past. 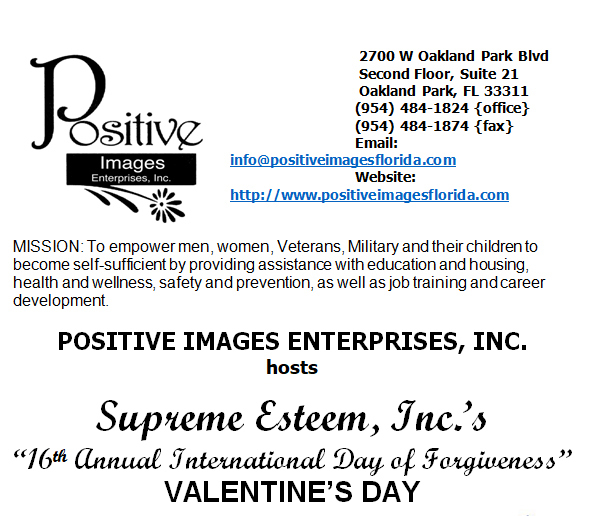 Questions, call Positive Images Enterprises, Inc. at 954-484-1824 or Supreme Esteem, Inc. headquarters at 954-392-3762, or 305-801-8100. E-mail j_hazel@bellsouth.net, or log onto www.supremeesteem.com REFRESHMENTS WILL BE SERVED! We look forward to seeing you there! 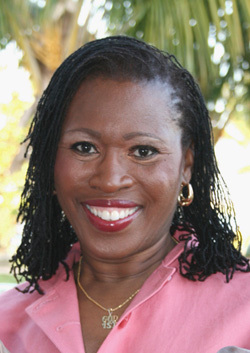 Jacqueline Hazél, President, Supreme Esteem, Inc. This observance is free and open to the public. Ms. Hazél has more than 25 years of speaking experience in the areas of self-esteem, drug abuse and professional/staff development. Whether keynote address, retreat or seminar Ms. Hazél brings integrity, contagious enthusiasm and an act now attitude to any environment. Supreme Esteem, Inc. is still basking in its 5th Anniversary Forgiveness Retreat held in South Africa. 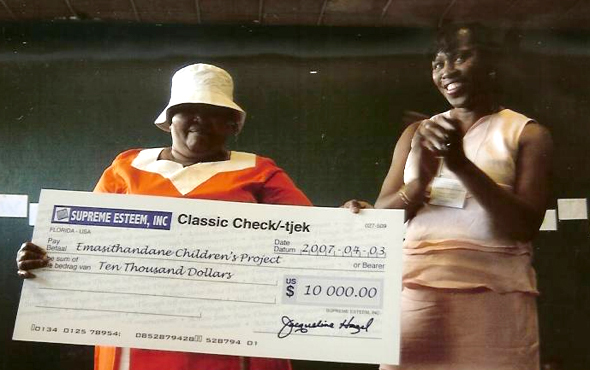 We raised $10,000 for one of Arch Bishop Desmond TuTu’s charities, Emasithandane Children’s Project (Mama Maphosela). Copyright © Supreme Esteem, Inc.